Roots Rock and Roll mixed in with Americana and the Jersey Shore rock and roll sound. 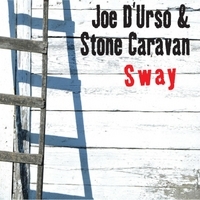 Joe D'Urso & Stone Caravan, an Americana/Jersey Shore/Rock & Roll band, released their 13th CD on SCR/Schoolhouse Records, titled "Sway" in the Spring of 2013. The 12 song CD was recorded in Nyack, Rockland County, New York and features 9 songs written or co-written by D'Urso and three tunes penned by Willie Nile, Steven Van Zandt and the late Terence Martin. "Sway" is an upbeat, rocking record and covers some good territory on the Americana/Jersey Shore/rock and roll painter's pallet. Joining drummer Sam LaMonica, bassist Mr. Lou DeMartino, guitarist Greg Lykins and D'Urso on "Sway" is Rita Harvey, Tony Pallagrosi, Neil Berg, The Maddog Horns, Steve Pavia, Greg Talenfeld, and Gordon Roehrer on voices, piano, horns, organ and cello. In 2010 released their 12th CD on SCR/Schoolhouse Records, titled "Down Here By The River,"in 2010. The 14 song CD was recorded throughout 2009 in JD&SC's home area of Rockland County, New York and features 11 songs written or co-written by D'Urso and three tunes penned by Marah (Round Eye Blues), Little Steve Van Zandt (All I Needed Was You) and the BoDeans (Angels). The 11 D'Urso songs/co-writes are "Down Here By The River," "Waiting On A Train," "Mystery," "On A Night Like This," "Anything More," "Since She's Been Gone," "Once Again," "Loving and Living," "Hold On," "Brass Ring" and "LaGuardia To Weehawken (or From Grave To Save)" and find Stone Caravan (Sam LaMonica on drums, Greg Lykins on guitars, Mr. Lou DeMartino on bass and D'Urso on acoustic guitars) joined by an array of vocalist friends: Willie Nile, Danny Zolli, Joe Rapolla, Carter Calvert, Dave McKeon and Tim O'Donohue. Also joining JD&SC on "Down Here By The River" is Stone Caravan alumnus Chuck Chesler on organ, accordion and piano, Perry Paletta on mandolin, Dave Yannuzzi on lap steel and dobro, Dave McKeon on banjo and Darren Lunar on percussion. The CD runs the gamut of straight-up Americana rock and roll, singer-songwriter offerings, Jersey Shore influences and New York State/Catskill Mountain country tinged instrumentation. The CD, with its flowing river images throughout many songs, ends with the co-written song "LaGuardia to Weehawken (or From Grave To Save)" with lyrics from D'Urso's boyhood friend who was a passenger on Flight 1549 that safely landed in the Hudson River. 2010 will find D'Urso, both solo and with Stone Caravan, traveling the world singing new songs with an old friend feel. JD&SC have performed on thousands of stages in 24 countries and have attracted fans worldwide since releasing their first recording in 1991. In April of 2009 JD&SC released their first live recording "One More Song Live" on SCR/Schoolhouse Records. This 32-track double CD was recorded in June 2008 at the legendary Turning Point in Piermont, New York and serves as a showcase of the band's energetic live performances. The live CD includes D'Urso-penned fan favorites like"Rock and Roll Call," "Noisy Guitars," "Welcome Home," "Tell Me Why," "So Tired," "Numb," "Minute To Midnight," "Glow" and many others. In January 2006, JD&SC released "Cause..." The 15-song "album" is divided into Side One and Side Two with topics ranging from friendship, war, marriage, oil, soul searching, and lost love. As in past offerings, D'Urso mixed his writing and music with full-out rockers and quiet observations. "Cause..." was recorded with more of a live, garage rock feel than previous offerings and is quite unique as it's "narrated" by wise musings/introductions by the late Harry Chapin. Besides 12 new D'Urso originals, JD&SC took on John Stewart's 1979 Top 5 hit "Gold", Bob Dylan's "I Shall Be Released" and Chapin's "Taxi". This CD followed up 2005's "Best 1991-2003". The 19-song compilation scans D'Urso's songwriting from a Greenwich Village startup to international independent touring artist. The CD includes 16 songs chosen by fans through JD&SC's website, as well as three unreleased songs. Also released was the band's foray into video with the DVD "3 Days in Italy," which documents two Italian performances in February 2004. This DVD was released through the band's "Bootleg Series" as it was shot and recorded by Italian fans.